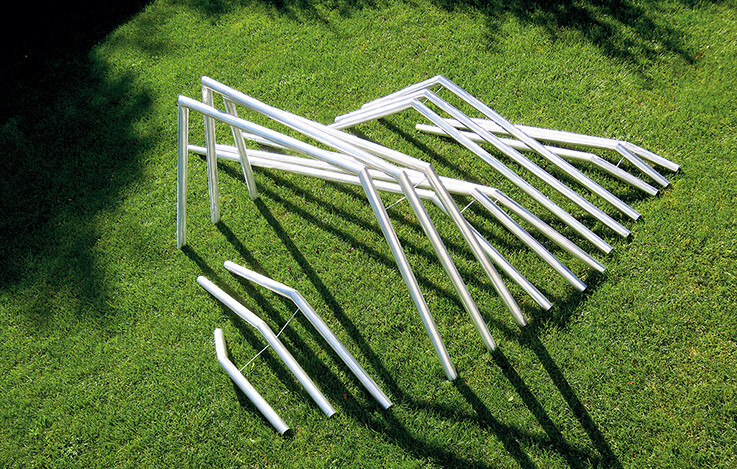 "Within" flows "outside" – stylized pipes leave their functionally determined ways in the underground and extend into the visible public space. Public utility infrastructure is the premise to productivity and progress of communities – nonetheless people are not aware of it as they take it for granted. The fact that pipes provide the daily base for modern public space but ideally have to remain hidden might be due to a common perception that pure functionality is unsightly. This sculpture turns functionality into its opposite by overemphasizing its esthetics. Shiny surfaces of cut metal in synopsis with the site reveal a play of light and shadows, color and form, which turns the otherwise invisible into something that can be experienced, and represents a tangible intervention in the incomplete perception of public space.